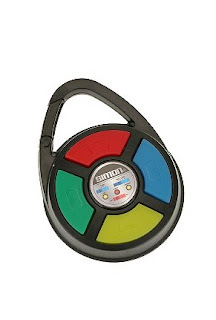 Do you remember this flashy electronic game? Long gone but obviously not forgotten by someone! Simon Says ...is back, and wants to give your PSP a run for his money. Small but mighty, Simon still wants you to follow his lighted way despite his new configuration as a tiny keychain plaything. Now you can take him on the go. Gaming simplicity at its best. What's next? Head-to-head baseball as a key chain? I bought my step-brothers the Simon keyring game as a novelty gift at Christmas! Just a little thing to remind them of their youth, surprisingly we're still no better at it! Some things never change, eh? :) I never had Simon, but I had Merlin. I loved that game...I didn't own it, a friend of mine did. Now I want the keychain version!